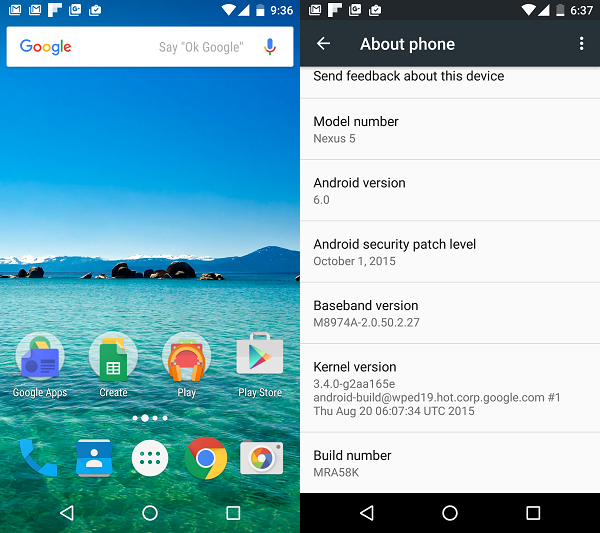 In this post I will show you how to install Android 6 Marshmallow on Nexus 5. The tutorial should also work on any other Nexus devices that support Marshmallow such as Nexus 6, Nexus 7, Nexus 9, and Nexus Player. Google officially released Android 6 Marshmallow in October 5th. It comes to bring new features such as Google Now on Tap, Fingerprint support, USB type-C, Battery life improvement and more. So it is worth to upgrade to Android Marshmallow for all Android users. I assume that your Nexus 5 is running the latest official Android 5.x Lollipop and not rooted before. 3. Android 6 Marshmallow Factory image for Nexus 5. You can find all factory images for Nexus devices on Google Developer page. Note that you also need an unpack tool to extract the .zip and .tgz files. You can use WinRar to do it if you are using Windows operating system. Grab it from rarlab.com. Unpack the “latest_usb_driver_windows.zip” file. Before connecting Nexus 5 to computer, make sure that you have enabled “USB Debugging”. Set the driver software location to “pathtoextractedusb_driver” and tick the “Include Subfolders” option. It will install the USB driver for Nexus 5. Open Windows Command prompt and go to “C:Program FilesMinimal ADB and Fastboot” then type “adb reboot bootloader” to reboot Nexus 5 into Fastboot Mode. If you encounter error like below, check the device to allow USB debugging. Then re-run “adb reboot bootloader” after allowing USB debugging. The device should boot into fastboot mode. You can see that the Lock State of the device is ‘locked’. You need to unlock it first before installing or flashing Android M into Nexus 5 device. Type “fastboot oem unlock” to unlock the device. A warning message will show up in the device. Use Volume Down/Up buttons to select Yes or No then press Power button to continue. Now type “flash-all” to start flashing Android M into Nexus 5. Just sit back and relax since this process will take couple of minutes. Nexus 5 device will automatically reboot and updating to the new operating system. Below is a screenshot of Android 6 Marshmallow running on my Nexus 5. Hopefully this post is helpful. Enjoy your Nexus 5 with the new Android 6 Marshmallow.